Despite slightly diverging views, Japan and the U.S. are capable of strengthening regional security. In the midst of rising Sino-Japanese tensions, a less-watched aspect of the Asian security dilemma is the alliance between the U.S. and Japan. The development of fears of entrapment and abandonment is a new obstacle for U.S.-Japan relations. How should Washington and Tokyo overcome this dilemma while strengthening the alliance? Before President Barack Obama’s trip to Japan last month, the Japanese side lobbied aggressively for a clear statement of U.S. commitment vis-à-vis the Senkaku Islands, which are also claimed by China as the Diaoyu islands. 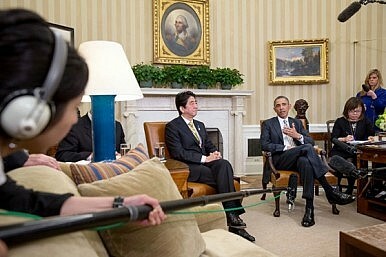 Despite his previous hesitance to give such a commitment, Obama made clear during his joint statement with Prime Minister Shinzo Abe that Article 5 of the U.S.-Japan Alliance covers the disputed territory. This put a temporary end to the argument between China and Japan over who would sway the U.S. position concerning the islands. A few weeks before the trip, the Chinese Minister of Defense Chang Wanquan told U.S. Secretary of Defense Chuck Hagel, “We hope that the U.S. could stay vigilant against Japan’s action and keep it within bounds and not to be permissive and supportive.” For the time being, however, it seems that China’s effort to diminish the U.S. commitment to Japan failed; yet the game continues. Alliance theory holds that the development of such fears on both sides is perfectly reasonable. Japan’s past leverage over the U.S. as the cornerstone of U.S. Cold War strategy in Asia has declined. While both share a significant economic interest in maintaining stable relations with China, their interests sometimes diverge, as shown in both countries’ opinion polls: more than 90 percent of Japanese people hold unfavorable views toward China, while the U.S. public regards China as their country’s most important partner in Asia. Within the two democracies, public opinion matters to a significant degree in the decision-making process. Recent Japanese actions undertaken despite U.S. opposition, such as the nationalization of the Senkaku Islands and Abe’s visit to Yasukuni Shrine, also undermine the trustworthiness of Japan from the U.S. point of view. U.S. efforts to restrain Japan, and its unwillingness to use force in the Syrian crisis, the Scarborough Shoal standoff, and Russia’s invasion of Crimea have reduced the credibility of U.S. commitments and exacerbated Japan’s fear of abandonment. In short, the new dilemmas the allies face today are indicative of a new security environment and Japan’s growing national capabilities. Facing this new dilemma, the U.S.-Japan Alliance requires meticulous management from both sides. Each side should prioritize reassuring the other to alleviate fears about entrapment and abandonment. Japan’s increasingly active engagement in the alliance, derived from its fear of China and concern about abandonment, can be enhanced by consistent communication with the U.S. The U.S. side should also continue to provide Japan with a consistently reassuring message by reiterating its commitment to Japan, even in the context of the Sino-Japanese rivalry. In this sense, Obama’s clear statement, which essentially provided a top-down message to the whole U.S. government, should be warmly welcomed by Japan. The U.S. should also welcome Japan’s development of an autonomous strike capability, concerning which it remained conspicuously silent at the 2013 Japan-U.S. Security Consultative Committee (2+2), in contrast to its consistently vocal support of Japan’s right to exercise collective self-defense. A Japan that has a “spear” capability, combined with the ability to exercise collective self-defense, can strengthen the alliance’s capabilities and deterrence power as a whole. North Korea, for example, is likely to be deterred further if Japan can respond independently. At the same time – although somewhat ironic because it weakens the deterrence power just mentioned – since Japan will still be reliant on the U.S. satellite system to target enemy bases, the U.S. can maintain its hedge against unwanted entrapment if it is concerned about Japan using such a capability to entrap the U.S. Both sides should bolster discussions to identify potential developments that could make the alliance stronger, more equal, and more sustainable. Ayumi Teraoka is a graduate student at Georgetown University.